SOUTHFIELD, Mich. — Established 15 years ago in Michigan, Automotive Credit Corp. began by providing indirect lending services to a select group of dealers in the state. Today, the regional lender works with both franchised and independent dealers and has slowly expanded its geographic footprint from its Midwest base to cover 11 states: Michigan, Ohio, Indiana, Illinois, Kentucky, Tennessee, Missouri, Florida, Georgia, Maryland and Virginia. The company's founder, James Blasius, said he started ACC with the intention of making life a bit easier for both dealers and consumers with credit issues. "I was introduced to the subprime auto finance industry in 1990 as an investor in the industry," Blasius recalled. "I reviewed the standard procedures of this industry, which mainly directed customers into older model/higher mileage vehicles, and I felt this did not provide them the best chance of success to reestablish their credit, and routinely set customers up for failure. 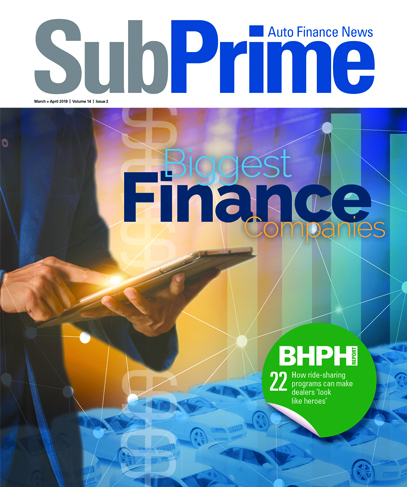 "My approach was to instill within the customer a sense of pride and ownership by providing various finance programs to the dealer, allowing them to sell new, lower mileage vehicles," he explained to SubPrime Auto Finance News. "This also provides dealerships with the opportunity to have a wider selection of desirable vehicles and greater customer retention." Blasius said his company's goal is to provide both franchised and independent dealers more attractive options to offer their credit-challenged customers. "Our philosophy is to place a great emphasis on where the customer is today and not the problems of yesterday," company officials said. "At ACC, we continue to review each and every application on an individual basis, with the goal of providing the dealership with hands-on underwriting, world-class personal service, along with the best financial opportunity through a wide selection of financing programs." In order to assist more dealers and customers, the company grew slowly over the years, via "controlled expansion," as Blasius called it. "Our business model was one of controlled expansion through flexible programs, reliable funding and personal service," executives said. "The expansion continued through existing relationships, word of mouth, along with our ‘boots on the ground' personable and knowledgeable sales team. This philosophy has provided us with a steady, controlled expansion. ACC's future plan is to continue expansion in the East, mid-South and select Western states." Technology has also aided the company's expansion. Officials said using new technologies such as ACC Dealer Gateway, RouteOne, DealerTrack and Finance Express have helped to meet the company's goals of making life easier for dealers by facilitating a real-time desktop-to-desktop link between ACC and dealer partners in F&I offices. "These new technologies will provide better service, faster decision times, trouble-free funding and an all-around easier process," ACC executives highlighted. "In addition to technology, we have formed several cooperative marketing relationships with major national companies, such as Aspen Marketing, Dealer Services Corp. and Phoenix American. "These companies provide trained personnel, along with new products and their existing dealer relationships in new territories," executives continued. "As ACC celebrates its 15-year anniversary, it continues to benefit from an executive management team with more than 100 years of combined experience in the subprime finance industry. "In addition, ACC's sales force of knowledgeable dealer consultants, which are located in every market, provide constant support, information and communication with our dealer base," officials highlighted. ACC provides a variety of financing programs that can be accessed, managed and monitored through its ACC Dealer Gateway technology, according to officials. The program pulls data from an online credit application that is then analyzed and rated through the company's use of a proprietary scorecard and credit analysts, officials explained. In addition to traditional credit bureau information being taken into account in the company's customized scorecard, ACC also looks at application information, N.A.D.A. values to loan and dealer contract performance/history with the company. "We offer financing programs for FICO scores as low as 400, with additional programs for near-prime credit," executives pointed out. "Another benefit of ACC Dealer Gateway is that it will allow the dealer to integrate inventory from the existing DMS system, structure the deal with the right vehicle to maximize profits and print the entire contract package. This will validate the figures and cross reference all related documents, providing an error-free complete contract package for faster funding," company officials explained. Dealers interested in partnering with ACC should keep in mind that the company evaluates each location based on several factors, including dealer reputation, years in business, structure and inventory of the used-car department, in addition to corporate financials. "As we do with each credit application, each location is given an objective review," executives said. Discussing what he sees for the future of the subprime market, Blasius told SubPrime Auto Finance News, "ACC sees the subprime market advancing at a lightning pace. Technology and relationships are driving the market. Unlike the '90s, where every week brought new finance companies in the marketplace, today only experienced companies with good systems, procedures, secure capital sources, responsible management and proper business ethics will prosper. "While many companies strive to be a national player, it is the strong regional players that will continue to provide the more personal relationship service that tends to get lost at the national level," he continued. "Our commitment as we expand our business is not to lose sight of the importance of personal relationships with our dealers." For more information on the company, visit www.automotivecredit.com.